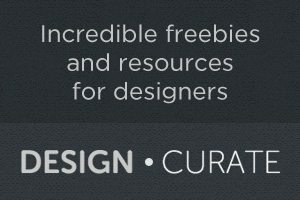 Design Curate is a collection of free and commercial resources for designers. It’s pretty simple. Any free resources are just that — completely free for you to use, incorporate in your designs, and build upon. We’re giving something back to the design community, and sharing our love of design. We hope you enjoy everything that Design Curate has to offer, and look forward to seeing you over there! If you’d like to submit your own resource to be featured on Design Curate, we’d love to hear from you. Just drop us an email for more information.